America’s only true stork is having another solid nesting season in Georgia. Aerial and ground surveys of wood stork nesting by DNR’s Nongame Conservation Section and conservation partners estimated 1,873 nests across 11 counties from Liberty to Mitchell. That’s fewer than last year’s 1,903 nests – and far shy of the 2,696 nests in 2010, the most since surveys by air began in the 1990s. But annual fluctuations for these endangered birds are normal, and long-term trends show nesting increasing in the state. Nongame wildlife biologist Tim Keyes, wood stork survey leader, pointed to sufficient rains this winter and spring that filled ephemeral freshwater wetlands across the region, spurring and sustaining smaller wood stork colonies, particularly in southwest Georgia. Although nest estimates were down nearly 30 percent in some large colonies such as Gilman in St. Mary’s and Harris Neck National Wildlife Refuge in McIntosh County, fewer nests and colonies were abandoned this year, Keyes said. Use freshwater and estuarine wetlands for breeding, feeding and roosting. Nest in colonies, building stick nests over water (alligators unwittingly help protect the eggs and chicks above from raccoons and other predators). First record of nesting in Georgia: 1965 on Blackbeard Island. Colonies this year ranged in size from four nests at a Glynn County golf course to 334 at Harris Neck National Wildlife Refuge. Nests documented in Berrien, Brantley, Brooks, Camden, Glynn, Jenkins, Liberty, Long, McIntosh, Mitchell and Thomas counties. 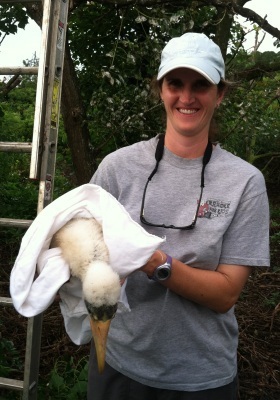 Researchers also banded about 80 young storks (including the one State Parks & Historic Sites naturalist Cate Ruka is holding above). Species listed as endangered when number of breeding pairs in the Southeast slid to about 5,000 in the late 1970s. Decline blamed on wetland habitat loss and alteration in Florida. Georgia now has 20 percent of U.S. nesting population. More than 75 percent of rookeries in the state are on private land, underscoring dependency on landowners protecting nesting sites. U.S. Fish and Wildlife Service proposed down-listing wood storks to threatened in 2012, citing population data and restoration. Reclassifying would not change protection or conservation measures. Find more about wood stork conservation in our annual report. At Georgia Wild, we’ve turned that around: We want you to tell us how we’re doing. And we honestly want to know! Please take this short survey. A few minutes of your valuable time can prove invaluable for us. We’ll take your answers to heart, and put them into practice, improving Georgia Wild to raise awareness and support for conserving nongame wildlife and habitats across our state, now and for future generations. 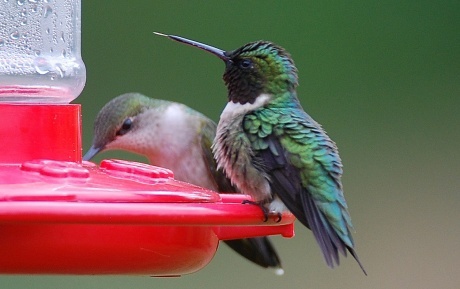 If you are like most hummingbird enthusiasts during the past few weeks, you have probably asked yourself, where are the hummingbirds? I wish I had a good answer. But I can tell you that just as July Fourth fireworks illuminated the night skies, the number of hummingbirds in your backyard will soon explode! By the end of the month, most ruby-throated hummers that breed in Georgia will have completed their nesting season. We’ll be seeing parents and offspring of not one but likely two nesting attempts. And in short order they will be joined by ruby-throated hummingbirds preparing for or are already migrating from more northern areas to wintering grounds. Read more about summer hummers and what’s coming soon in Terry’s full column! Fledgling success among endangered red-cockaded woodpeckers recently banded at Silver Lake Wildlife Management Area is looking good. Thirty birds have fledged at the near-Bainbridge WMA, a number of them females, according to Nongame Conservation Section biologist Joe Burnam. 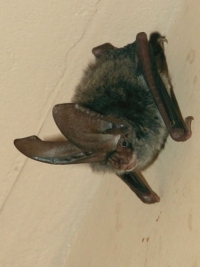 A thermal camera recently helped record the evening emergence of an estimated 20,000-plus Southeastern myotis from a southwest Georgia cave. Nongame biologist Katrina Morris and Nikki Castleberry of the Georgia Museum of Natural History were monitoring bats at that cave and another near Albany – where they documented their first juvenile bat of the season. Wanted: barn owl box donations. Georgia Important Bird Areas coordinator Charlie Muise has put out the call for building materials and help building, noting that the program has installed about 40 boxes in two years but has other sites in need of a box. Photos. 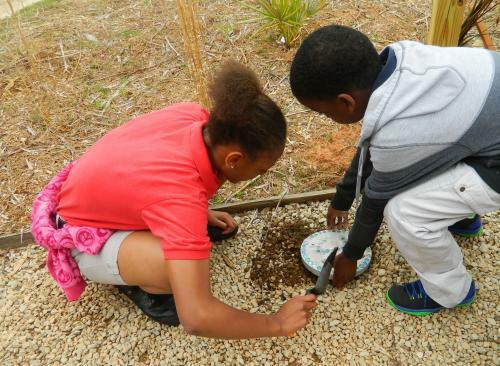 Students at Fowler Drive Elementary in Athens install stepping stones at the school’s “coastal” garden recently. The garden, which features plants native to the Georgia coast, is part of a project that earned science teacher Halley Page a $1,000 grant from DNR’s Nongame Conservation Section and its friends group, The Environmental Resources Network. Nongame and TERN are looking for another Georgia third-, fourth- or fifth-grade teacher who demonstrates exceptional energy and innovation in teaching life sciences and could use $1,000 toward that effort. The deadline to apply is Sept. 16. Review details and download a grant application. Read the news release. Learn more about TERN.